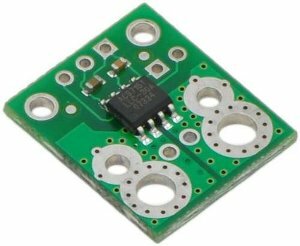 This board uses Allegro’s ACS714LLCTR-30A-T Hall effect-based linear current sensor. Read the datasheet for the all the gory details, but this sensor is very easy to use with Arduino or any other microcontroller. Connect the sensor between the power supply and your load, and then connect the output to an analog input pin on your Arduino or other microcontroller. This device uses only one analog pin on your microcontroller board. This version accepts a bidirectional current input with a magnitude up to 30 A and outputs a proportional analog voltage (66 mV/A) centered at 2.5 V with a typical error of ±1.5%. It operates from 4.5 to 5.5 V and is intended for use in 5 V systems. See this tutorial for a nifty Arduino based current/voltage/power monitoring system.